ePublishing Knowledge BaseePublishing Knowledge BaseePublishing Knowledge Base Creating and Managing Directories & Buyers GuidesHow do I control who receives notifications in my company when new directory listings are purchased? A purchase email confirmation will be sent to the reader/customer who purchased the listing. 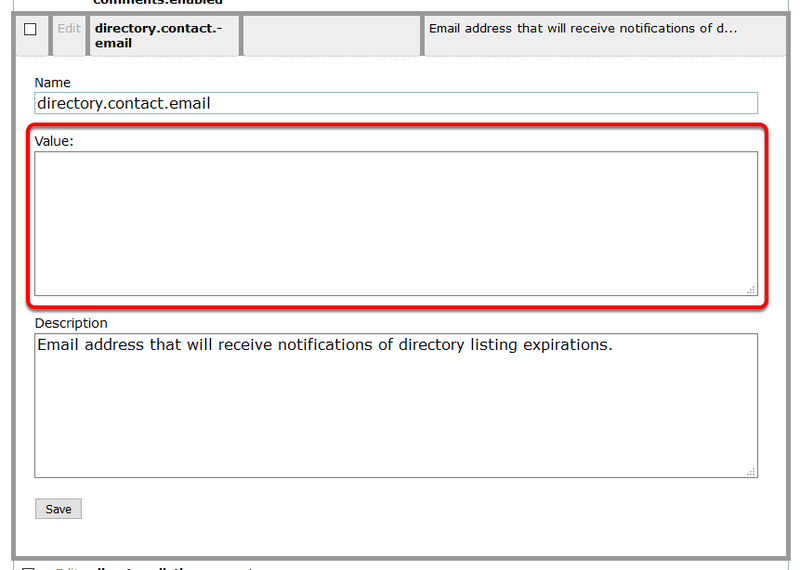 It will also send a notification to someone in your organization based on the directory.contact.email system setting. To update the email address of the person(s) inside your company who will receive notifications, click Edit next to directory.contact.email in your System Settings (found under Sys Admin on your Admin dashboard). This system setting controls the email address in your organization that will receive notifications of new directory listing purchases. Update the Value with the email address(es) you'd like, separated by commas, to send notices to internally. Zoom: Update the Value with the email address(es) you'd like, separated by commas, to send notices to internally. Prev: How do I enable comments on directory listings? Next: How do I control who receives notifications in my company when directory listings are updated?